Flipping through different cheeses recipes, I stopped on a recipe I had passed by many times; colby. To me, colby is the ultimate mass-produced supermarket cheese. Unlike a cheese like deli munster, which is brushed with orange dye on the rind to imitate a washed-rind smear, colby revels in its unnatural coloring. The blend of orange and white curds clearly identifies itself as a product of a regimented lab. But in a way, it looks kind of cool. Flavorwise, it would taste like a baby gouda. But perhaps it could be more than that? I never looked twice at Cheshire until I tried the real, farmhouse original by Appleby's. Same thing with Sparkenhoe Red Leicester or Gorwydd's Caerphilly. In the right hands, any "supermarket cheese" could be made to show off its more interesting nuances. So the idea of making a "rustic" colby just got caught in my maw. Production-wise, colby is halfway between a gouda and cheddar. Similar to a gouda, the curds are washed with hot water, which rinses away the milk sugars that would normally make a cheese become sharp with age. But unlike a gouda, the curds are worked over. It's just not the extensive churning that gives a cheddar its compact, tight-knit texture. So you have a smooth cheese along the lines of a mild cheddar. 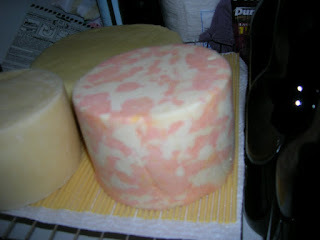 To achieve a more "farmhouse-esque" product, I used raw milk and decided to age the cheese with a cloth binding. Cloth binding acts as a natural skin for cheese, resulting in a drier, flakier texture. 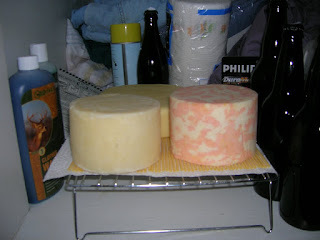 Wax coatings will give you a moist cheese with a buttery texture. Getting the signature orange-white marbling was a bit trickier. 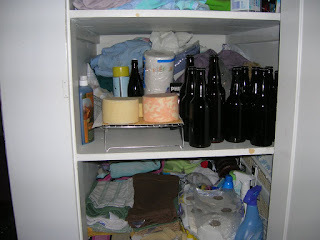 I ended up making the cheese in two one-gallon batches. One batch was kept white, while the other one was mixed with orange food coloring. 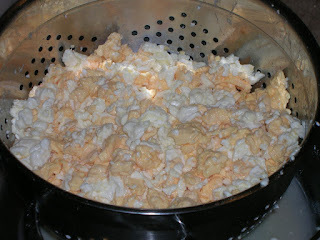 When I came to the point of washing the curds with hot water, the dye was set and wouldn't bleed into the white curd. The colby was pressed for 18 hours, ending with a 12 hour push at 40 lbs of pressure. This is about half the time for my cheddar, which usually is pressed for 36 hours, ending with 55 lbs for 24 hours. Now it'll dry for 3-4 days before I bind it in cloth. I'm hoping this works, but either way it looks pretty impressive!